This article was written collaboratively by a group of LGBTQA Fulbright English Teaching Assistants (ETAs) who would prefer to remain anonymous. But there is one element of our personal diversity we will never be able to use. Most of us will never open up to our communities, or at least our school communities, about the fact that we are LGBTQA. Our individual experiences are as varied as the incredible diversity that makes up Indonesia, and some of us are more comfortable in our situations than others. Part of this comes from the personalities and backgrounds we carried with us in our luggage, right next to our journals, and part from the uniqueness of the communities we currently live in. At first glance, this poster appears to be friendly and supportive. But the firm “Say no to LGBT” at the bottom of the poster makes its intentions clear. Propaganda like this hangs in schools across Indonesia. Nonetheless, a vast majority of us must keep this part of ourselves secret. And even as we do so, it still manages to permeate so much of our experience as ETAs. We are continuously surrounded with propaganda that claims we are wrong, an abomination. Local newspapers announce that various powerful factions of the Indonesian government want to “tolak,” or exclude people like us. More extreme posters and bulletin boards in our communities and our schools claim we are all drug addicts and pedophiles. (ii) We are in the teachers’ room, watching the news, and we hear these same sentiments echoed amongst those we call our colleagues, our friends. We tell them this is not true, but never as ourselves. We use the word “them” when we want to say “us,” because to do otherwise would be unsafe. We barely feel safe as it is. We try to speak loudly and clearly, and sometimes we are brave enough to do so, but sometimes we only manage a hushed, wavering voice, scared that who we are really are will be heard underneath our thick mask. We go to a wedding dressed in our finest traditional outfit, one that draws admiration from all around us, as do our Bahasa Indonesia skills, which we have worked hard on throughout our time here to improve. We sit with our friends, the people who have so kindly taken us to so many other events. The speeches begin. We start to tune out; we’ve heard so many wedding speeches at this point we probably whisper them in our sleep. But then we tune back in. This speech is different. The speaker goes on at length about how this marriage is an example of a perfect marriage… because it is between a man and a woman. The speech ends with a prayer to eliminate all LGBTQA communities from the world, without any mention of the bride and groom, as we are more accustomed to hearing. Almost desperately, we reach out to friends and cohort members, seeking the validation that we doubt we could receive from those around us, who nod in agreement throughout the speech. Perhaps they do so out of social pressure and a desire to save face, or perhaps out of true agreement; we cannot be sure, and are often too afraid to ask. We are sad and angry, but we fear letting it show. We reach out metaphorical hands though the digital waves that connect us to those so far away, who can give us a squeeze in a few lines of text, telling us that how we feel is okay. We spend weeks helping the students we adore prepare for our school’s WORDS competition. The theme is three wishes and our only wish is that our students who participate recognize how brave and wonderful we know them to be. Not all of our students have time to show us their speeches before they perform, but we encourage them to participate anyway. “I believe in you!” we say. The day of the competition comes, and these students, whom we love and admire, stand in front of an audience and wish that “there would be no more LGBT in Indonesia.” We sit, and we stare into our laps, fingers intertwined tightly to maintain composure. We wonder what would happen if they knew their “beloved English teacher” is gay. Would it complicate how they feel about the LGBTQA community? Or would it just ruin the relationship we have worked so hard to build? We do not love our students less. We know the world they live in all too well. But we are still hurt. We are hurt because it is so painful to listen to so much negativity being said about us, and not be able to defend ourselves, to be able to do nothing but hide. We are hurt because we see students who do not fit into the boxes the world has drawn for them, and we wish we could show them that there is nothing wrong with them. We want to be the proof that they can spread their iridescent wings and fly, the way we did once we saw people like us amongst the ranks of our world leaders. We know representation is important, but we do not feel secure enough to be that representation for our students. We try to understand, to maintain perspective. We know this is not unique to Indonesia. Around the globe, the LGBTQA community is fighting to survive, let alone be recognized, and while progress is certainly being made, we still have a long road ahead of us. Some of what we experience in Indonesia mirrors what we experience at home in America: friends who stopped talking to us after we trusted them enough to come out, family members who are not safe spaces and force us to live a lie among those who should love us most, organizations that make us hesitant to work in certain fields, and rampant closed-mindedness that makes us scared to walk alone at night. LGBTQA rights are expanding rapidly in America, and many of us are finding spaces in which we are accepted and celebrated, but this change is recent, and has had more than its fair share of setbacks. What we observe, what we experience in Indonesia, is not new. That does not make it any less difficult. And we hope. Sometimes, we hope because it is all we can do. We must hope or give up our remaining faith in humanity. But sometimes, we hope because we are given reason to hope. We hope because little things, the tiniest moments, help us to see the potential for change. We meet Indonesians who are also on the LGBTQA spectrum. We go hiking with them, try new foods with them, and eventually open our hearts to them, removing any secrets from our relationship. Through navigating conversations and building friendships with these amazing people, we not only find the system of support we crave from our communities, we find our own identity as an LGBTQA person complicated, and we find we understand our world, and ourselves, better. We come to realize how lucky we are, that we can leave and go back to a country where gay marriage is protected by the law. When we leave, we try to return the support they so selflessly gave us. We meet other Indonesians who are not part of the LGBTQA community, but who are strong allies in so many ways. These incredible individuals speak out when blind hatred is being spewed all around them. They express their sadness that there is so much hatred of LGBTQA people in their communities. Sometimes we feel safe enough to come out to these people. Sometimes we can’t. But either way we love them with all of our hearts, basking in the light of their understanding, of their love, of the hope they embody for the world. We have conversations with students after class—and, on rare occasions, in class—as many of our students are curious about the LGBTQA community in America. 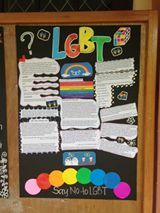 We tell them about the recent protection of gay marriage, about the various ways in which the community is protected and still left vulnerable by policy. Our students question. They grapple with this cultural difference. They sometimes conclude that people like us are good people, who should be supported. Sometimes, our students prove themselves to be the sort of allies we used to only dream of, without any help from us. Out loud, we thank these students for being so wonderfully supportive of their fellow human beings. In our hearts, we thank them for being so unashamedly and unknowingly supportive of people like us. Sometimes, there is a student whose colors are a little different: a twelfth grade boy who loves to sing and dance, and wears eyeliner to school, even after being belittled by the teachers; a tenth grade girl who wears pants and batik, instead of the more feminine kebaya, on Hari Kartini, and who refuses to cut her hair in a “girl style.” We do not pretend to know how these students identify, or how they might identify if they were in a more open society. But no matter who they feel they are on the inside, we see something of ourselves in them. So we smile a little wider whenever we cross paths in the courtyard. We try to let them know how magical we think they are. And though we do not dare to tell them who we really are, part of us hopes they see through us, and know they are not alone. Sometimes, we think see a glimmer of recognition when our eyes meet theirs. We hold on to these moments, and we allow ourselves to hope, to dream of something better. We hold them close to our hearts, where its warm beat might help these small moments to expand, to grow for an Indonesia, an America, a world that is universally more welcoming, more loving, of people who are like us. (i) It is important to note that not all ETAs are universally accepted into their communities, and issues surrounding race, gender, and body size abound. Religion, especially, can be an issue for ETAs, and some ETAs who are Jewish, agnostic, atheist, or of some other religion that does not fit into the six state-sanctioned religions (Islam, Christianity, Catholicism, Hinduism, Buddhism, and Confucianism) choose to pass as a member of another religion. (ii) Many Indonesians are raised to associate the LGBTQA community with such issues as drug abuse and pedophilia. Since the education system does not challenge, and often encourages, this idea, it is difficult for students to understand anything different. This is not to say that there are not plenty of Indonesians out there fighting the good fight, because there are.